Today (17th April), on the International Day of Solidarity with Palestinian Political Prisoners, more than 150 European trade unions, political parties, human rights organizations and faith groups from over 16 European countries issued a call urging the EU to uphold its legal responsibilities and exclude Israeli military companies from EU Framework Programs. This call – accompanied by an explainer video – comes at a time when at least 35 unarmed Palestinians have been shot dead by Israeli snipers during three weeks of protests at Gaza’s border with Israel. The 150 strong list of signatories includes 20 signatories from Ireland, including political parties Sinn Féin, Solidarity, People Before Profit and the Communist Party, trade union organisations like TSSA and Dublin and Derry trades unions councils, NGOs like Afri, the Africa Centre and Centre for Global Education, solidarity groups like the Ireland-Palestine Solidarity Campaign, Sadaka and Academics for Palestine, and other anti-war, anti-racist and social justice organisations. From the rest of Europe, it includes the European Network Against Arms Trade – a network of 18 organisations from 13 European countries, the National Federation of Railway Workers, Transport Workers, Officials and Employees of Luxembourg, Norwegian Union of Municipal and General Employees, Comisiones Obreras and CGT in the Spanish State, La Centrale Generale FGTB in Belgium, UNISON in Britain and the north of Ireland, the Belgian Workers Party, Podemos in the Spanish State, déi Lénk in Luxembourg, a global Catholic peace movement Pax Christi International, Friends of the Earth Finland, Human Rights League in France and Kairos Sabeel in the Netherlands and UK among others. See below for letter and full list of signatories. The signatories call on the EU to immediately exclude all Israeli military and security companies from the EU framework programs, given that an analysis of past projects has shown that their participation in these programs inherently involves EU support for the development and legitimisation of, and profiting from, technology and methodology used by Israel in the commission of war crimes and human rights violations. “Public and governmental bodies must respect their obligations under international law and their own constitutions. 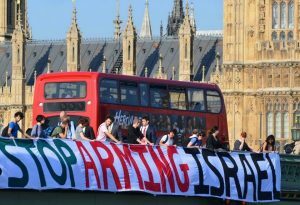 It is time for European citizens to demand that not a penny more of their tax money be gifted to Israeli military and security corporations and institutions. It’s also beyond time for national governments to pressure the EU on its political and ethical inconsistencies, and for the EU to respect its own legislation” – said Ana Sanchez, international campaigns officer for Palestinian Boycott National Committee, one of the signatories of the call. One of the ways in which arms and military companies have gained access to EU funding is through the current EU Program for Research and Innovation, Horizon 2020. This includes many Israeli military companies. Although the EU claims that research funds have gone only to projects with civilian applications, many of the projects approved are of dual-use nature serving military interests as well. Many others serve policies that curb or violate refugees’ rights and militarise our societies. 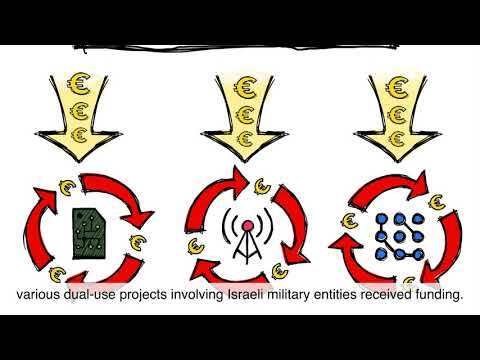 The EU’s cooperation with Israeli military companies is proof that dual-use projects are inherently serving military purposes as well. Isaac Ben-Israel, Chairman of the Israel Space Agency, put it bluntly: “because we are a small country, if you build a small-satellite production line, say at IAI, it will be used for military and for commercial purposes.” The ECCP and Stop the Wall undertook a thorough analysis of EU projects which involve Israeli military companies; the analysis shows how public European funds are currently being used to develop, legitimise and profit from technology that is “field-tested” by Israel in the commission of war crimes and human rights violations. There are many indications that the EU’s ‘border control’ policies are built on concepts and technologies that violate human rights. From the Transnational Institute and StopWapenhandel a well-documented report shows how Israeli companies have a unique selling strategy, capitalising on the fact that Israeli technology is ‘battle proven’ during illegal actions and policies of ‘border control’ and ‘population control’ in the context of occupation and colonisation, such as the Wall in the occupied West Bank, the siege and military attacks on Gaza, and many more examples. Israeli military and homeland security companies, such as the Israel Aerospace Industries, have played a role in fortifying the borders of Bulgaria and Hungary, in the EU maritime surveillance programmes, and in the EU Frontex programme in general. The EU refuses to take into account the grave misconduct of companies as well as the origin and possible destination of such technology thereby violating its own rules and regulations. In July 2017, 25 international law experts published a legal opinion regarding the case of the Horizon 2020 LAW TRAIN project, which is based on cooperation with the Israeli police, which have a track record of torture and other human rights violations. The experts’ report highlights the need to exclude such actors demonstrably involved in systematic violations of human rights. By funding such projects, the EU simply turns a blind eye to grave violations of international law and human rights carried out within or outside its borders. To ensure transparency and democratic control over EU research programmes’ annual calls for proposals. 57. Institut für Palästinakunde e.V. 81. Rete della Pace – network of 60 organisations – involved in peace, disarmament, noviolence, human rights.